Emily's hourly rate for events is $150, with a two-hour minimum. All drawings/silhouettes are personalized with name of event and date. All drawings/silhouettes come in a clear plastic bag. Wedding receptions have a three-hour minimum. Additional hours can be added on at event if there is no event following. BW Party-style +1 Color: 8 x 10 or 11 x 14 on cover stock paper, done in the same media) archival marker and fine-artist colored pencils) that I use for live events; however I spend much more time than five minutes! Must be shipped to you, and/or can be scanned if you need it quickly. Color Party-style: 8 x 10 or 11 x 14 on cover stock paper, done in the same media (archival marker and fine-artist colored pencils) that I use for live events; however, I spend much more time on them than five minutes! Must be shipped to you, and/or can be scanned and emailed if you need it quickly. Airbrush: 11 x 14, these are done using archival marker, an Iwata airbrush and artist-quality paint. Must be shipped to you, and/or can be scanned and emailed if you need it quickly. 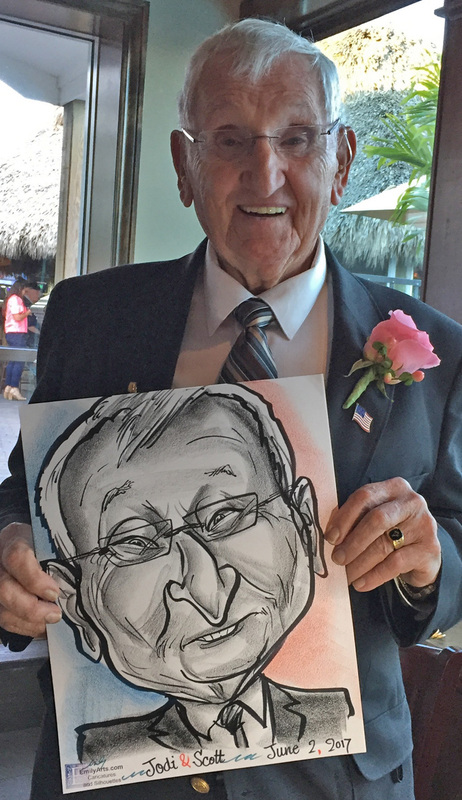 No more than four sunjects can be depicted in an airbrush caricature. Digital cartoon-style: A black-outline drawing filled with basic shaded color, using my Wacom Inutous tablet to draw in Photoshop on my Macbook Pro. These are done in a variety of sizes and are emailed to you upon completion, you print the image at your location. My most popular option! Digital painted-style: A fully rendered painting in full color, using my Wacom Inutous tablet to draw in Photoshop on my Macbook Pro. These are done in a variety of sizes and are emailed to you upon completion, you print the image at your location. Complex backgrounds, hobbies, cars, pets, etc. are additional, and Emily gives you a quote. After rough sketch is shown, one major revision and up to two small revisions (revision size is determined by Emily) are included in the price. Revisions beyond that will incur extra charges. 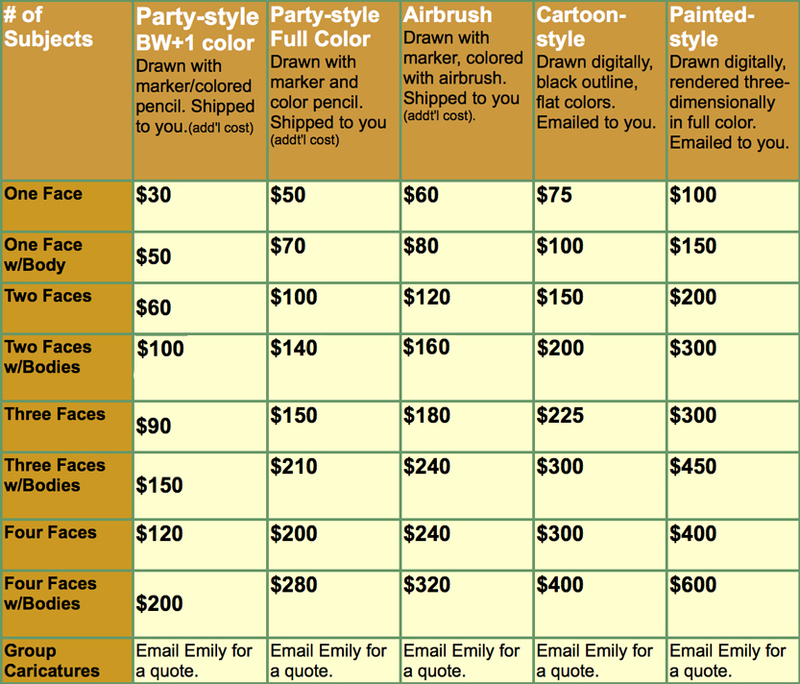 Prices for Party-style and Airbrush Caricatures DO NOT include shipping. This price list is for PERSONAL USE caricatures only. For COMMERCIAL USE (for business purposes---logos, business cards, promotional items such as t-shirts or mugs) please double the prices. Purchase of COMMERCIAL USE caricatures includes the copyright, so that artwork can be published or used in any manner client wishes. For commissions and deposits for events, Emily accepts payment preferably by credit card online (she will invoice you by email) OR Paypal OR snail-mailed check or money order. For balances at events, she prefers checks made out to 'Caricatures by Emily Byrne', but can also accept credit cards, or cash.